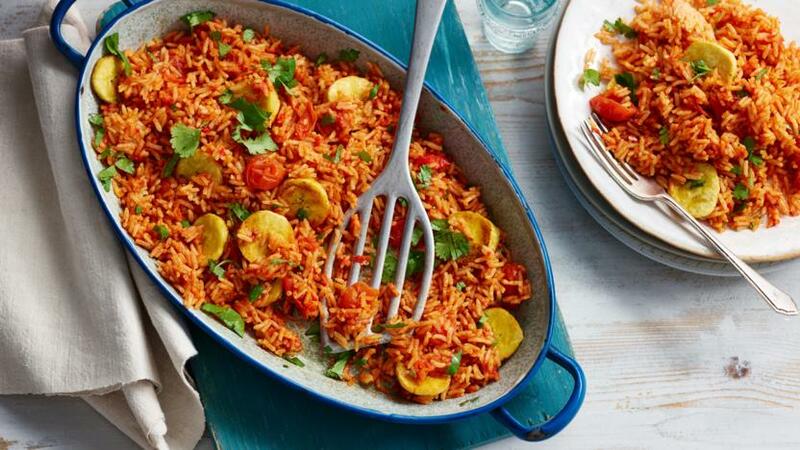 Jollof rice is a spicy African rice dish that cooks in one pan, uses lots of veg and can be a veggie main or a side to some simply baked chicken. Put the passata, tomato purée, chillies, onions, peppers, garlic, rosemary, thyme, ground coriander and paprika in a blender or food processor and blend until smooth. Heat the olive oil in a large saucepan over a medium heat. Add the cherry tomatoes and the blended tomato sauce. Bring to the boil, then reduce the heat slightly and simmer for 5 minutes, stirring occasionally. Add the stock, bay leaves, rice, 1½ teaspoons salt and a large pinch of black pepper. Stir to combine and bring to the boil. Reduce the heat and simmer for 10–12 minutes, stirring frequently to prevent the rice from sticking, until the rice is cooked through. Turn off the heat, cover with the lid and leave to steam for 15 minutes without removing the lid. Meanwhile, heat the sunflower oil in a frying pan over a medium heat. Fry the plantain for a few minutes on each side until golden and tender. Spoon the jollof rice onto warmed plates and add the plantain on the side. Garnish with the chopped coriander and serve with a green salad alongside. If you are vegetarian or vegan, replace the chicken stock with vegetable stock.